At a recent Rotary Club of Scottsdale meeting, Ms. Keli Jo Hause, Gift of Life - Arizona Inc recognized Scott and Patti Miller for their long-time support of Gift of Life - Arizona Inc. Gift of Life-AZ - a nonprofit tax exempt 501(c)(3) organization administered by participating Rotarians and friends for the purpose of providing open-heart surgery to needy children worldwide. The mission of Gift of Life-AZ program has provided medical care and support for needy children and their families worldwide who are suffering from congenital heart defects. Scott Miller, Past Rotary Club of Scottsdale Club President, served as on Program's Board Treasurer. 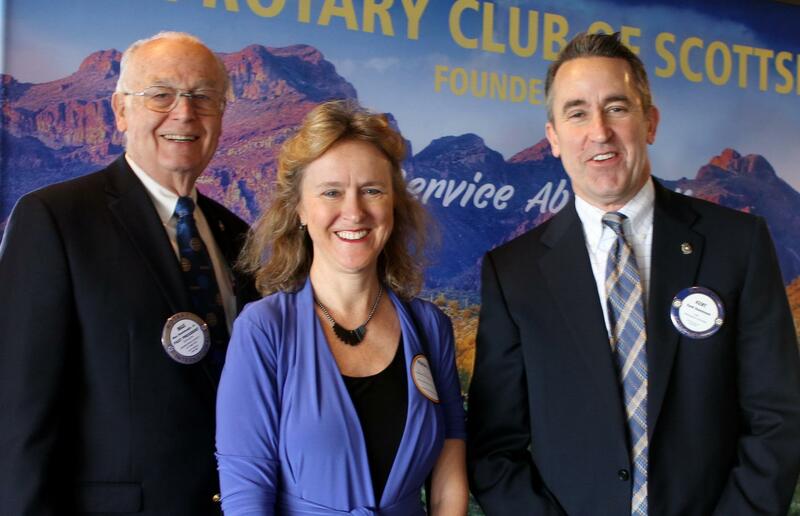 Patti Miller serves as Rotary Club of Scottsdale's Executive Administrator. For many years, both Scott and Patti have shared their gifts of time, talent and resources to advance the work of Gift of Life-AZ. Additionally, Ms. Hause, thanked the Rotary Club of Scottsdale for its support of the Program. Before introducing the Millers, John Abbs, Gift of Life - Arizona Inc Board Chair and Rotary Club of Scottsdale member, stated that the Gift of Life Program has provided the means for over 320 needy children from 24 different countries, 29 of which are from the USA, to have successful open heart surgery; provided medical equipment and supplies to both local and foreign hospitals; provided training and education to doctors in foreign countries; and has funded continuing education for local pediatric cardiac care nurses; and funded a clinical study of Phoenix-area children with cardiac defects. 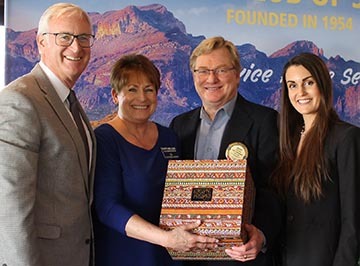 Ms. Zarrin Caldwell, a Rotary International Peace Fellow, spoke to members and guests of The Rotary Club of Scottsdale at a meeting held at Scottsdale's McCormick Ranch Golf Club's Lakeside Pavilion. When introducing Ms. Caldwell, Past Club President Max Rumbaugh, stated that Ms. Caldwell was granted in 2011 a scholarship for Rotary International's Rotary Peace Fellowship. Ms. Caldwell received a graduate certificate in the field of Peace and Conflict Studies from Chulalongkorn University's Rotary Peace Center in Bangkok, Thailand. Ms. Caldwell currently serves as secretary and member of the Board of Directors of Global Ties, AZ. As liaison, Ms. Caldwell has designed over 50 programs for the U.S. Department of State's International Visitor Leadership Programs from Washington, DC from 2012-2017 and, now based in Arizona. Ms. Caldwell, now a Fountain Hills, AZ resident, shared her experiences of traveling to over 30 countries to connect people and ideas. While talking about the Rotary Peace Fellow, she invited members and guests to nominate candidates who would study aboard in graduate programs that address Rotary International's main areas of focus - supporting education, providing clean water, promoting peace, saving mothers and children, growing local economies and fighting disease. For more information about Rotary's Peace Fellow program see: www.rotary.org/en/our-programs/peace-fellowships or contact Rotary Club of Scottsdale for sponsorship. The Club is looking forward to its annual Spring Training Outing at Salt River Fields on February 25, 2019. For more information about the baseball game or about the Rotary Club of Scottsdale speakers, projects, programs and meeting dates and locations - see www.scottsdalerotary.org. Visitors to Club meetings are always welcome - call 480-945-6158. Monday, February 11th, 2019 – On February 11, 2019 the Rotary Club of Scottsdale will host Sonora Governor Claudia Pavlovich at their weekly meeting held at McCormick Ranch Golf Club. The event will be an opportunity for the Club’s more than 125 Members and guests to hear, first-hand, about the economic, tourism and educational value of the relationship between Arizona and Sonora, Including the importance to the small business community. The Rotary Club of Scottsdale will be joined by Representatives from the Arizona-Mexico Commission, Hispanic Chamber of Commerce, US Consul to Mexico, Arizona Governor Doug Duchy’s Office, along with area business, community, and political leaders. Claudia Artemiza Pavlovich Arellano, currently serves as the Governor of the Mexican State of Sonora. She is a successful lawyer affiliated with the Institutional Revolutionary Party (PRI). She was elected as the first woman to govern the state the State of Sonora and is currently the only female Governor of any Mexican state. Her paternal family is of Serb descent. Previously she served as Senator of the LXII Legislature of the Mexican Congress representing Sonora. She and Arizona Doug Ducey have partnered for the past four years to strengthen relations between Arizona and Sonora to their mutual benefit. Ms. 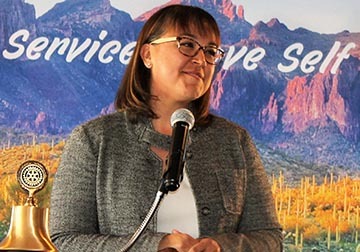 Blessing McAnlis-Vasquez, Salt River Pima-Maricopa County Indian Community's Tourism Division Manager, spoke to Rotary Club of Scottsdale members and guests at a luncheon meeting held at Scottsdale's McCormick Ranch Golf Club's Lakeside Pavilion. When introducing Ms. McAnlis-Vasquez, Rotarian James Carusone stated that Ms. McAnlis-Vasquez spearheads the tourism enhancement efforts of the Salt River Indian Community via promotion of the Talking Stick Destination. Ms. McAnlis-Vasquez leads marketing, communication, community outreach and public relations efforts for the Entertainment Destination area. She develops marketing and social media plans, monitors budgets and oversees a successful ambassador training program. She acts as a liaison between the Salt River Indian Community and its tourism properties/enterprises, building relationships, developing innovative marketing programs and fostering effective communication. During her talk, Ms. McAnlis-Vasquez introduced Martin Harvier, who serves as the 25th President of the Salt River Pima-Maricopa Indian Community. After 12 years serving as vice president, Harvier stated, as president, he will work with the tribal council and community managers to better the community. 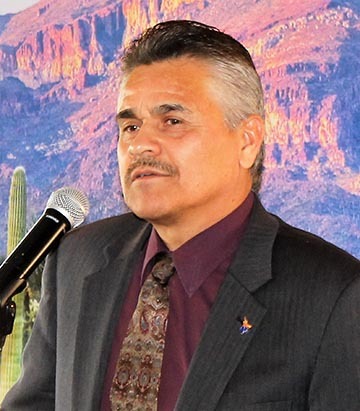 During his talk, Harvier provided an overview of the Salt River Pima-Maricopa Indian Community's nine-member tribal council; overview of a few of the in-progress cultural projects and related archeological findings discovered at construction sites - noting that some of the digs can be dated back to 700AD and 300BC; relationship of canal systems and their service to the community at large. Harvier shared the history of the Pima tribe and noted that the currently 40% of those living in the community are under age of 21. The Community consists of 54,754 acres that border cities of Scottsdale, Mesa, Fountain Hills and Tempe.